Home » Formula One: Rosberg grabs British pole with last gasp lap! 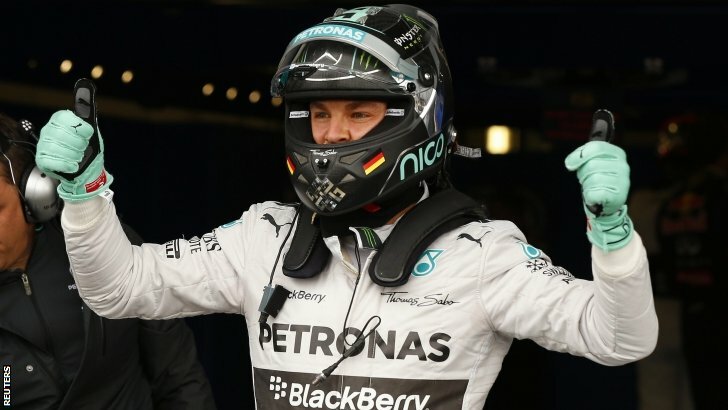 Nico Rosberg has taken pole position for the 2014 British Grand Prix at Silverstone after a dramatic qualifying session in changeable conditions. Pole was looking certain to be Hamilton’s in the final minute of qualifying before an unexpected improvement in track conditions allowed drivers to improve and push him into 6th. Sebastian Vettel was one of the drivers who improved and will line up 2nd on the grid, with Jenson Button the highest placed home driver in 3rd. 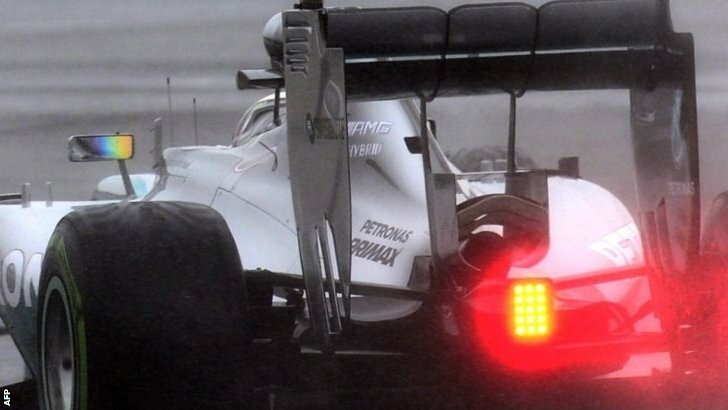 Both Williams and Ferrari cars were shockingly eliminated in the first session. With Vettel and Ricciardo 1-2 for Red Bull in the final wet practice session, the Silverstone circuit was still sodden as the first 18 minute qualifying session got underway. The two Marussia and Sauber cars were first out on track, with Chilton and Gutierrez trying to get as high up the time-sheets as possible before they received their 5 and 10 place grid penalties. Gutierrez got the fastest time initially, before Vettel, Ricciardo and then finally Hamilton came through to displace him. With half the session gone, Lewis was on top by a second ahead of Ricciardo, with Rosberg 1.2 seconds down after his first lap. The final 5 minutes of the session saw an improvement in track conditions, which led to the drivers start to head out on the dry compound tyre. Gutierrez and Chilton were once again among the first out on track, with the Mexican briefly taking the top spot back. Button then took P1, but had his time deleted after a mistake saw him go briefly off track at the final turn. He still managed to sneak through to Q2 with another lap a few moments later. Button’s time removal meant that Marussia were briefly 1-2 on the time-sheets, before rookie Kvyat stole their thunder. Rosberg then spoiled any hopes of an unusual pace-setter for Q1 by returning to the top spot. Alonso was under pressure after the mass improvement on track. He had been pushed down into the drop-zone, along with team-mate Raikkonen and the two rival Williams cars. None of them were able to lift themselves out of the bottom 6 after a late return of the rain caught them all out. Alonso spun his car at Brooklands, with Kimi, Bottas and Massa also having to slow to stay in a straight line. Adrian Sutil was also caught out in his Sauber as he got stuck in the gravel, but had set a time that would see him go through to the next session. Joining the shock eliminations of the Ferrari and Williams cars would be Marcus Ericsson and Kamui Kobayashi in the Caterhams. Surprise Q2 qualifier Chilton was on of the first to emerge for the quarter of an hour 2nd session. The track conditions were nearly identical to that seen at the start of Q1. Jean-Eric Vergne was the early pace-setter for Toro Rosso, with Rosberg beating him shortly after. Team-mate Hamilton seemed to be the quicker driver however as he went 6 tenths quicker a few seconds afterwards. Sebastian Vettel took P1 away briefly, but had his time deleted as the stewards stern stance on track limits carried on. The end of the session, like the beginning, was a replication of Q1. The track started to dry sufficiently for the dry tyres to come out of their blankets. 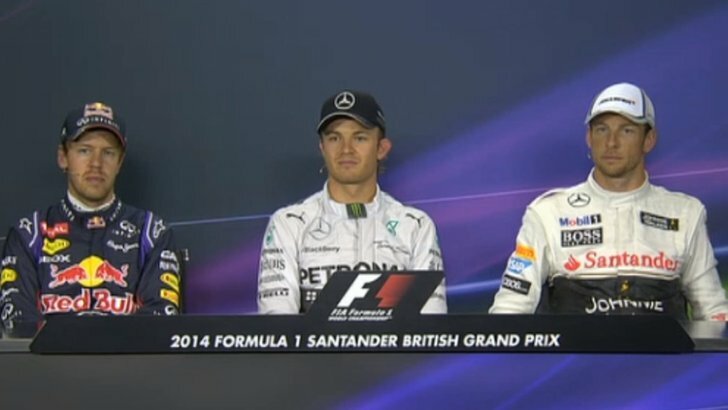 Rosberg was the first to set a dry lap and went 2 seconds quicker than Hamilton. Vergne then went up to P1 for Toro Rosso, with a spate of other drivers improving to push the Mercedes pair into 7th and 8th. Rosberg then took it back, before Hamilton ended the battle by going faster than Nico by 2 tenths of a second. P1 might have been under threat for Hamilton in the final minute, but Esteban Gutierrez spoiled the fight after bringing out the yellow flags at Luffield. 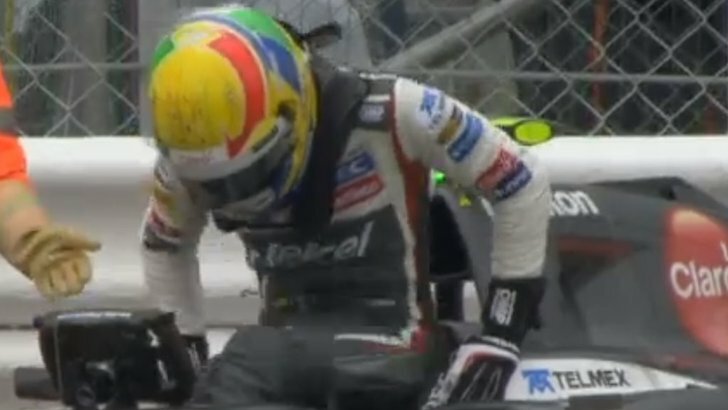 The Mexican lost control of his Sauber going into the hairpin and rear ended the wall. The yellow flags meant no one was able to improve without receiving a penalty; thus ending the two Marussia’s chances of making it to Q3 for the first time. It was an impressive run for the pair however, with Bianchi qualifying 12th and Chilton 13th; the Briton would start 18th unfortunately due to a 5 place grid penalty for a gearbox change. Romain Grosjean and Pastor Maldonado were also eliminated along with the two Sauber cars following Sutil’s end of Q1 gravel excursion and Gutierrez’s trip into the barriers. The top 10 shootout in Silverstone was to be made up of team-mates. Both Mercedes, Red Bull, Force India, Toro Rosso and McLaren drivers were taking to the track to decide who would start on pole position. The track started out dry unlike the first two sessions, but it only stayed that way for a few minutes. As the drivers came to the end of their first laps, the rain started to fall in the final sector. The two Toro Rosso’s and Sergio Perez managed to beat the rain to complete their laps, with Sergio Perez in P1 and hoping that the rain would fall too hard for anyone to beat him. The shower was not enough to contain the Mercedes duo, with Hamilton taking provisional pole by 1 tenth ahead of Rosberg. The drivers came into the pits as the rain got increasingly more intense. It looked as though qualifying was over early as it was seemingly too wet to get an improvement. Near the end of the session, the track improved a little, which saw the drivers come out to test the conditions. It seemed as though it was still too wet for dry tyre running, with Ricciardo, Kvyat and Vergne all choosing to stay in the pits rather than risk another run. As the 7 drivers on track geared up for an exploration lap on the dry tyres, Nico Rosberg radioed his team saying that Lewis was going too slow. Nico only just managed to start his final lap, with the checkered flag coming out less than a second after he crossed the line. Lewis soon gave up on the lap as he felt that it was too slow to make a difference. However, as the drivers entered the final sector, they found that it was much drier than expected. Hulkenberg, Magnussen, Vettel, Button and Rosberg all found a huge chunk of time which put them in contention for the pole! Hulkenberg briefly grabbed pole away from Lewis, with Vettel then taking the top spot after not setting a time earlier in the session. Button and Magnussen also pushed Lewis down, with team-mate Rosberg dealing the final blow by stealing pole position in Hamilton’s home event.